There is much debate over the origins of cheesecake; some say it dates back to ancient Greece and others to ancient Rome (approximately 200 BC). An English cookbook - Forme of Cury, from 1390 boasts a cheesecake recipe too. Australians tend to favor an unbaked cheesecake flavored with fruits like passion fruit, lemon and raspberry, while lychee and mango are favored in Asian cheesecakes. The traditional base in Britain is crushed biscuits. These cakes are often refrigerated rather than baked. You might find them flavored with coffee, tea or a nip of Irish cream liqueur. In the USA, baked cheesecakes are preferred. New Yorkers like their cheesecakes with sour cream while the traditional Philadelphia cheesecake has a much lighter texture. Some recipes use buttermilk which result in a firmer texture. 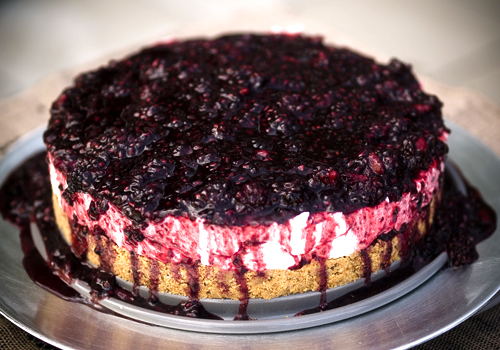 German cheesecakes usually have a dough base. Honey and ricotta are common in Italian cheesecake recipes. Cheese and cherries (Israel cherry season is May & June) are a classic combination but you can use other berries as well. There is nothing nicer than the rich red fruit dripping down the sides of the cheese cake creating a pool of sauce in your plate. Preheat the oven to 180ºC. Grease and line the bottom and sides of a 24cm springform cake tin. Mix the biscuits and butter in a bowl, press into the base of the prepared tin and cook for 10 minutes. Then remove from the oven and allow to cool. Turn the oven up to 200ºC. Combine the sugar and cornflour in a bowl. Add the cream cheese and beat, ideally with an electric whisk, until creamy. Add the eggs and beat well. Gradually add the cream, beating until smooth, then beat in the vanilla seeds or extract and lemon and orange zest. Scrape the mixture on to the biscuit base, and gently shake it to level out the surface. Put the cheesecake in the centre of the oven and bake for 40 to 45 minutes until the top is golden brown and the filling has set around the edges. (A piece of foil over the top will stop it browning too much.) Let it cool at room temperature and serve after 2 or 3 hours, or, for a slightly firmer texture, put it in the fridge until it’s nice and cold. Before serving, put the cherries in a pan, sprinkle over the sugar and add a splash of water. Put on a low to medium heat and simmer gently for 10 minutes. If you’ve got some port or whisky handy, feel free to add some. When the compote has reduced down it may be a little dry, so add a splash of water to loosen it. Remove from the heat and let it cool down, then serve spooned over the cheesecake with a dusting of icing sugar. Isabella Mary Beeton (1836 - 1865), universally known as Mrs. Beeton, was the English author of Mrs Beeton's Book of Household Management. She is commonly known as one of the first and best cookery writers and aspiring chefs follow her sometimes complicated recipes with absolute precision. Set oven at 180°C. Make the base. Melt the butter in a frying pan and stir in the breadcrumbs. Cook over gentle heat, stirring until crumbs are golden. Remove from heat; stir in sugar and cinnamon. Press the crumbs over the base of a loose-bottomed 18cm cake tin. Beat the egg yolks in a mixing bowl until liquid. Add the sugar to egg yolks, beating until creamy. Rub the cheese through a sieve into bowl then work in lightly. Add lemon rind and juice to the mixture with soured cream. In clean, grease free bowl, whisk the egg whites to soft peak. Stir 30ml into cheese mixture, then fold in the rest lightly. Turn the mixture gently on prepared base in the cake tin. Bake for 45 mins then cover loosely with foil and bake for further 15 mins. This is a simple recipe that is absolutely delicious. You can enlarge the recipe bigger by adding another 250g cheese, 100ml sugar, another egg, one more tablespoon of cornflour and another 50 ml of soured cream. Combine biscuit crumbs and melted butter, press into the base and the sides of a greased baking dish. In a large bowl combine the cheese, sugar, and cream. Mix by hand with a wooden spoon adding one egg at a time. Mix the cornflour with a few drops of milk to make a smooth paste and then add to mixture. Pour mixture on top of biscuit base. Bake at 180 C for 20 minutes. Turn the oven off and bake for a further 45 - 60 minutes or until the cake is set. Mix all ingredients for the crust and press onto the base of a greased 23 cm pie dish. Slice strawberries and puree in blender with milk and 25 ml powdered sugar. Beat together cottage cheese, 75 ml powdered sugar, egg yolks and vanilla. Soften gelatine in water and dissolve over low heat. Beat into cheese mixture together with the puree. Whisk egg whites stiffly with a pinch of salt and fold in together with cream. Pour into chilled crust and return to fridge until set. Garnish with a few sliced strawberries, some whipped cream and a few mint leaves. If you are lactose intolerant, Shavuot is a very difficult time. 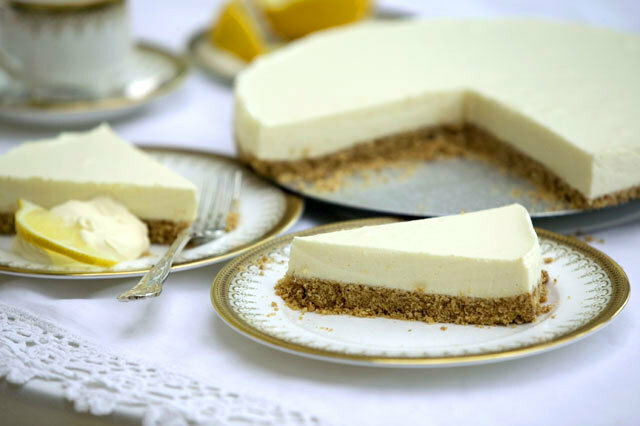 Our friend Shmuel S. certainly understands the difficulties and so he sent us his lactose free cheesecake recipe. Mix the cream cheese, sour cream, lemon juice, vanilla and sugar together in a bowl. Add small quantities of the beaten egg to the mixture and between each addition mix well. Once all the ingredients are well mixed, place the mixture in saucepan. Cook over a very low heat until the mixture thickens. You need to make sure that the eggs are well incorporated before you start heating. You do not want the eggs to scramble. Chill in the refrigerator until you are ready to serve. 1 cup of cold unsalted butter, cubed (remember if you are making a lactose free cheesecake, you need to use a parev or non-dairy margarine. In a bowl of a stand mixer add both types of flour, sugar, salt, cinnamon and baking powder. Stir to combine. Rub in cubes of butter/margarine until the mixture is crumbly. Add honey and water gradually and mix until the dough can be gathered into a ball. Shape the dough into a flat disk. Roll between two pieces of parchment paper until 1/4 inch thick. Cut into required shapes or sizes and place on baking sheet. Bake at 160 C for about 15 minutes. If you are using this recipe to make a pie crust, roll out your dough so that it will fit in you pie dish and the bake. Only add the cheese filling once the crust has baked and cooled. Have you heard the term 'Baking Blind'? What does it mean? Baking blind (sometimes called pre-baking) is the process of baking a pie crust or other pastry without the filling. Blind baking a pie crust is necessary when it will be filled with an unbaked filling (such as with pudding or cream pies), in which case the crust must be fully baked. Once you have rolled the pastry, and placed it in the baking tin, prick the base of the pastry with a fork in a few places then, line the tart tin with baking parchment and then fill with ceramic baking beans or dried pulses. The holes and weight of the beans prevent the pastry from rising.